Chicken can be prepared hundreds of different ways, but this Neapolitan chicken dinner will be a memorable one. Traditionally Naples is the home of pizza and formed the basis for much Italian-American cuisine. But as we all know, many wonderful dishes came out of this beautiful region. This delicious recipe, made with artichoke hearts, sun dried tomatoes, leeks and mushrooms, is quite unique and simple to make. My wife says that anything I make in one pot is delicious. Since she’s part of my clean up crew I don’t think this is a fair assessment of my cooking. Anyway, this combination of vegetables and tender, juicy chicken will give you a satisfying feeling with every bite. 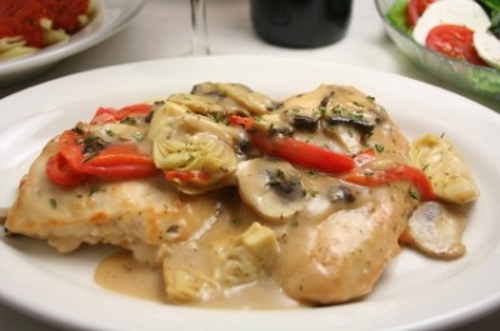 Neapolitan chicken is great for family gatherings or dinner with that special guest. In a large skillet or two add around 2 Tbls. of oil and brown chicken on both sides. Add remaining oil and sauté leeks and garlic for 3 minutes. Add sun dried tomatoes, mushrooms and artichokes for another 2 minutes. Sprinkle basil and oregano all over the chicken. Add broth and cook covered for about 30 minutes. Plate the chicken on a serving dish and pour over sauce with vegetables. Mangia Italiano!